Grilling in the summer is one of my favorite things to do. The food tastes so much better, cooking can be made easier by just throwing on a protein and some vegetables on the grill and it is fun. We try to grill at least a few times per week in the summer. Once fall comes, we always say we are going to grill but then never do. That is why in the summer we take advantage and fire up the grill regularly. Making pizza on the grill has been on my cooking bucket list for the last two summers. I kept wanting to make it and then something would happen where we would eat something else instead. This summer, I knew it was time to finally make a pizza on the grill. Troy and I love using a fresh sauce for our pizza so I chose one that was full of flavor and had a fresh tomato taste. Then we topped it with hand-grated cheese and a bunch of vegetables. The pizza turned out great and we will be making grilled pizzas again. I'm not sure what took us so long! I guess I was scared that the crust would burn. It does take some careful observation to watch the crust during cooking but turned out great without issues. 1. Roll out pizza dough on a flat surface. 2. Turn grill on high and let warm up. Bring all ingredients outside to make grillside. 3. Place all diced vegetables into a packet of aluminum foil with about 2 tsp of water and place on grill. 4. Once grill is hot, brush pizza dough with olive oil (I used a silicone brush for this). 5. Place pizza dough on grill and let cook for about 2-3 minutes. 6. Remove dough from grill, brush uncooked side with olive oil and flip over onto a large cutting board. 7. Flip vegetable packet and let cook a few more minutes. 8. Top cooked side of dough with pasta sauce and shredded cheese. 9. Remove vegetable packet from grill and pour contents over pizza. 10. 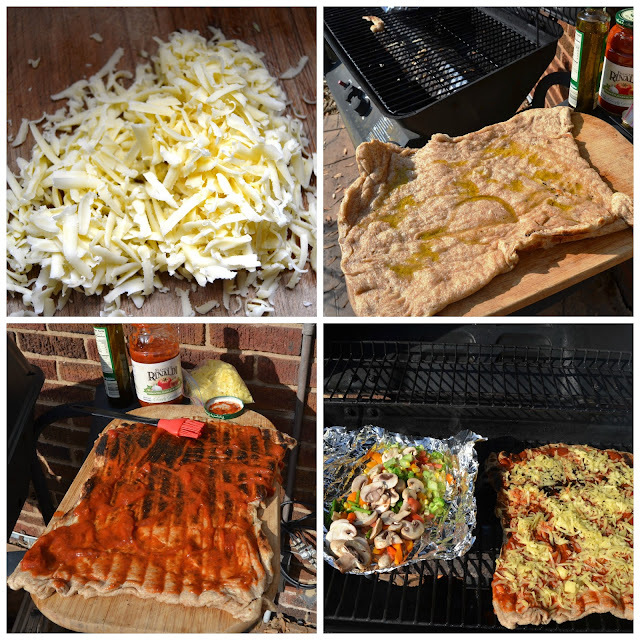 Return pizza to grill and cook for 2-5 minutes until dough is cooked and cheese is melted. *Make sure you have all of your ingredients ready to go next to the grill. The dough does not have to cook long and it may burn if you leave it unattended.